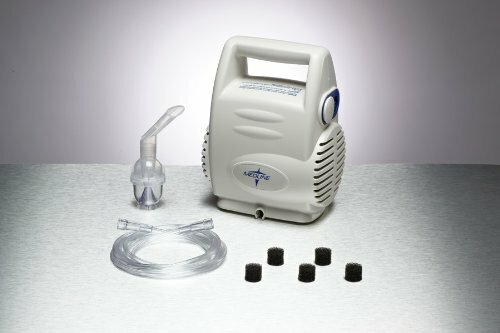 Aeromist Plus Nebulizer Compressors are easy to pick up by the molded handle. Break-resistant hinges. The compact design easily fits on small surfaces and the cord conveniently stores inside the shell when not in use. Low center of gravity when laying flat on the four non-skid rubber feet. Aeromist Plus Nebulizer Compressor details: Electrical Requirements: 115 VAC /60 Hz; Power Consumption: 75 W; Dimensions: 4. 1 (105 mm) H x 5. 7 (145mm) W x 7. 9 (200 mm) D; Weight: 1. 6 kg (3. 53 lb. ); Sound Pressure Level: 53 dBA; Max. Comp. Pressure: 30 PSIG or greater; Neb. 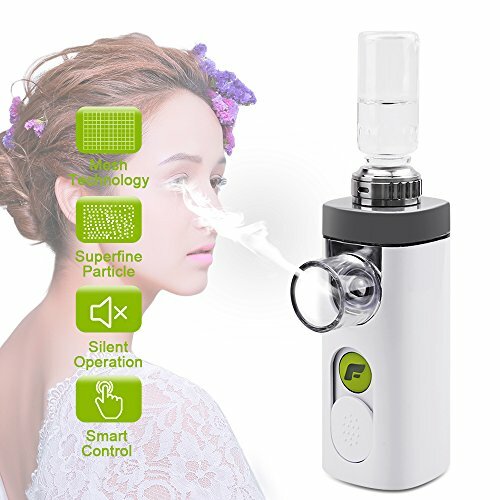 Operating Pressure: 10 ~ 14 PSIG; Liter Flow Range: 4 -8 LPM; Particle Size Less Than: 5 microns; Maximum nebulizer solution capacity: 10 ml; Operating Temperature: 10 C ~ 40 C (50 F to 104 F); Operating Humidity: Up to 95% non-condensing; Storage/Transport Temperature Range: -20 C ~ 60 C (-4 F to 140 F); Storage/Transport Humidity: Up to 95 % non-condensing. 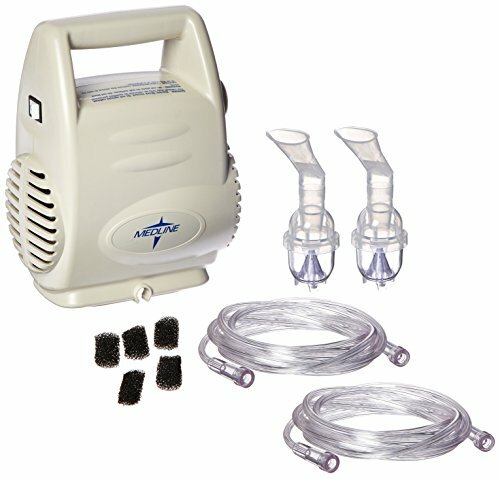 Includes 1 disposable nebulizer kit (Reorder HCS4483) and 5 washable replacement filters(Reorder HCS60004F). 5 year warranty. 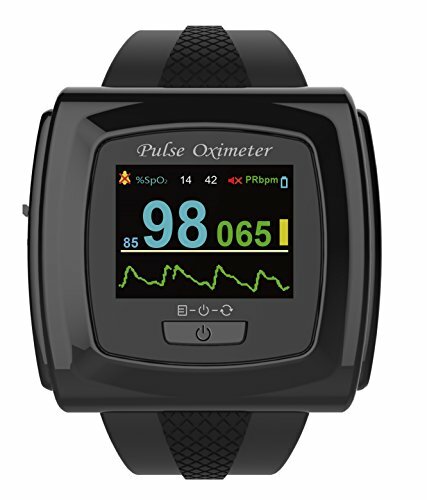 The CMS 50F wrist pulse oximeter comes with a newly designed Innovo SnugFit probe that can measure blood oxygen saturation (SpO2) and pulse rate through your fingertip with extreme precision. It also contains a built in auditory and visual alarm that warns you if the oximeter is not place correctly on the finger, the battery is low or when your SpO2 is beyond set limits. 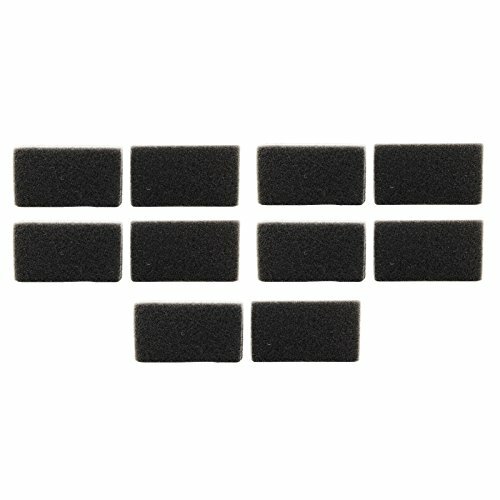 This allows athletes to fully concentrate on their activities. The CMS 50F also has the ability to store 24 hours of data, which can be uploaded to a computer for analysis if one wishes. This is extremely helpful to aviators who want to monitor their SpO2 and pulse performance during long flights. Superior 256K color OLED screen with rotational display allows you to see the readings clearly and conveniently. The device charges when connected to a computer or to the power supply via the provided power adaptor. The perfect high quality eye dropper set for use with essential oil, DIY crafts, stains, soap making, lab experiments, and aromatherapy. 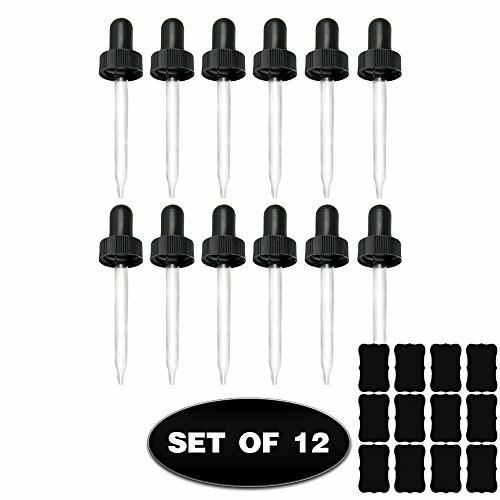 You get a pack of 12 pre-assembled droppers with a 20/400 finish (designed to fit standard Boston Round 1 ounce essential oil bottles) & a free set of 12 chalkboard sticker labels. Glass Eye Droppers come pre-assembled and feature a ribbed screw closure with a glass pipette and bulb. The perfect high quality eye dropper set for use with essential oil, DIY crafts, stains, soap making, lab experiments, and aromatherapy. 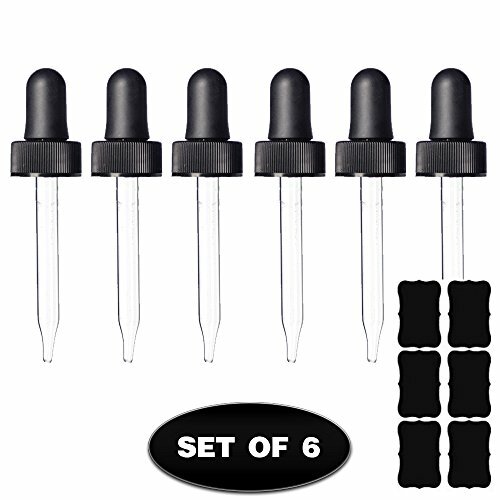 You get a pack of 6 pre-assembled droppers with a 18/400 finish (designed to fit standard 1/2 ounce (15ml) essential oil bottles). Features a ribbed screw closure with a 2.375 " glass pipette and rubber bulb. The perfect high quality eye dropper set for use with essential oil, DIY crafts, stains, soap making, lab experiments, and aromatherapy. 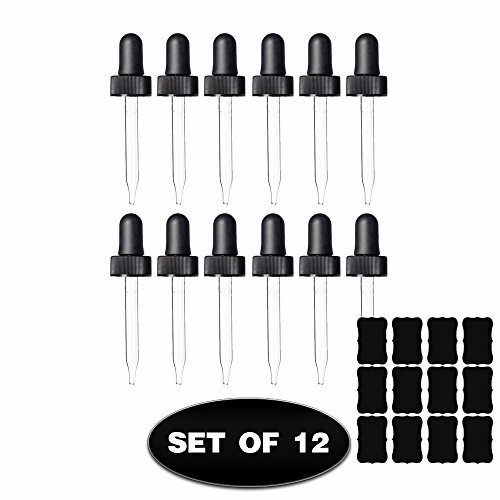 You get a pack of 12 pre-assembled droppers with a 18/400 finish (designed to fit standard 1/2 ounce (15ml) essential oil bottles). Features a ribbed screw closure with a 2.375 " glass pipette and rubber bulb. Plus bonus 12 chalkboard sticker labels included with purchase. Aeromist Plus Nebulizer Compressors are easy to pick up by the molded handle. Break-resistant hinges. The compact design easily fits on small surfaces and the cord conveniently stores inside the shell when not in use. Low center of gravity when laying flat on the four non-skid rubber feet. Includes 1 disposable nebulizer kit (reorder HCS4483) and 1 reusable nebulizer kit (reorder HCS4483R), instructional DVD and 5 washable replacement filters(reorder HCS60004F). 5 year warranty. Electrical Requirements: 115VAC/60Hz. Power Consumption: = 75W. Dimensions: 4. 1 (105mm) High x 5. 7 (145mm) wide x 7. 9 (200mm) deep. Weight: 3. 53lbs (1. 6kg). Sound Pressure Level: = 60 dBA. Max. Pressure: = 29 psi. Operating Pressure: 10-14 Psig. Operating Flow: 5-8 LPM. Maximum nebulizer solution capacity: 10 ml. Operating Temperature: 50º Fto 104º F (10º C to 40º C). Operating Humidity: up to 95% non-condensing. Storage/Transport Temperature Range: -4º F to 140º F(-20º C to 60º C). Storage/Transport Humidity: Up to 95% non-condensing. Works only with Pari Nebulizers - LC Sprint, LC Plus, and LC Star The PARI Adult Aerosol Mask is designed to make treatments more comfortable for those who are used to masks. 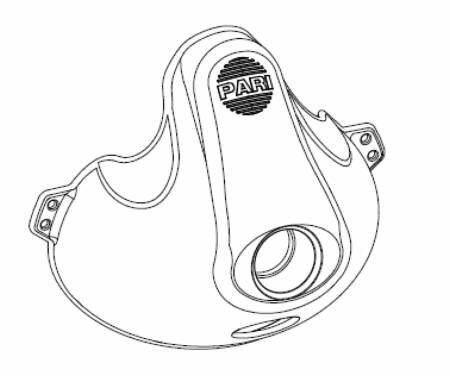 Made of soft PVC material, this mask will fit Pari Nebulizers. 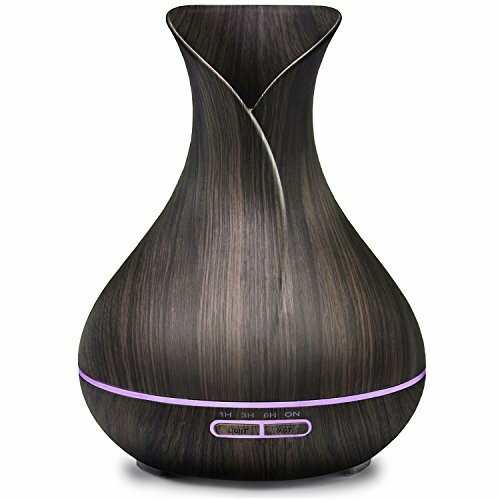 May not work with non-Pari nebulizers.